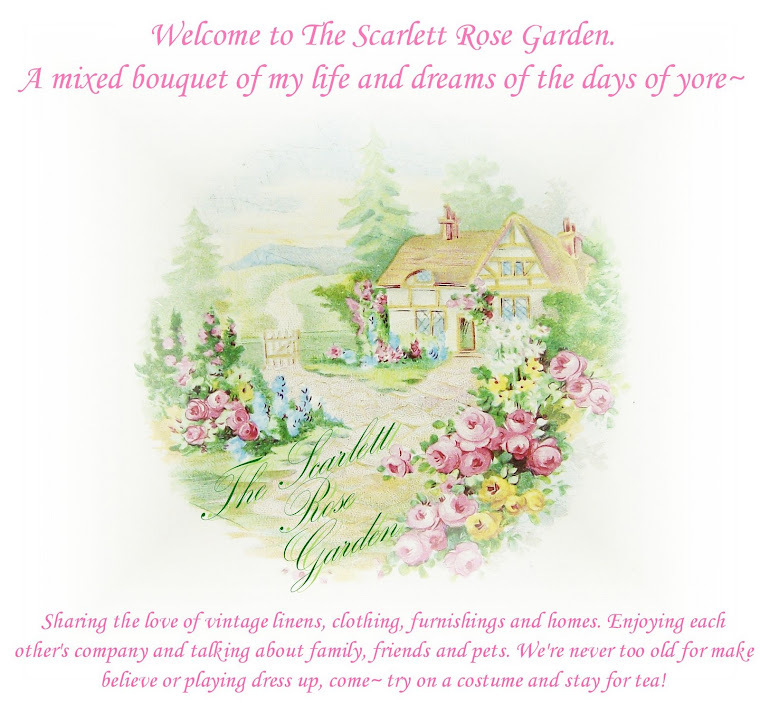 The Scarlett Rose Garden: My little buckaroo has learned to poo! My baby is growing up!! We've been working hard on potty training all weekend. Finally, today~ I think he's got it! We started trying last year. I put him on his potty seat for the first time while waiting for bath water to run. Almost as soon as I sat him down, he pooped! I was so excited, I thought WOW~ this is going to be a BREEZE! Well, much to my dismay, he didn't do it again until this weekend, lol! I worked with him off and on all year but I could tell that mentally he was just not getting it. I was just running myself ragged taking him in the bathroom every 30 minutes. I even tried going cold turkey and using good ol' cotton training pants. He soaked 12 pair in one day and I said the heck with it. I wanted to get this battle won this summer... but he's also been getting his molars and he gets the runs while teething. SO, not gonna even go there while that's going on!! Then my FIL showed me an article in the paper about potty training on certain days according to the Farmer's Almanac. I told my girlfriend about it... she tried it and it worked!! I didn't want to do anything before we went to Branson, but was ready to go full on when we got back. So this past Friday was one of THE DAYS, and it worked out perfectly because I was off work Fri, Sat, Sun, and Mon. I really think he's *trained*. I'm sure he might have a few accidents but that's ok. I bribed him with M&M's after he would go, and also Spuddies, (aka Pringles). 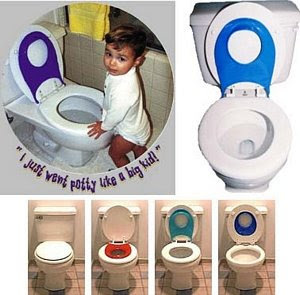 I have spent so much $$$ on different potty seats. The first one I bought was a little chair, with a removable cushy seat. I wanted him to be comfy, ya know? Well, that thing was gross. When he peed, the stream would hit the guard, then run all around the underside of the cushy seat. So, not only did I have to empty the potty, but lift that seat out of it and clean all of that. Blech! 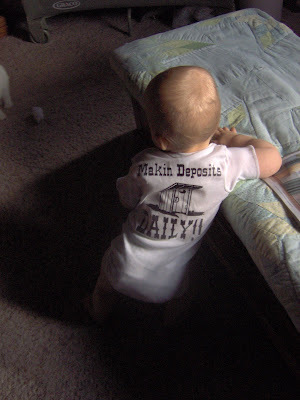 Here he is at a year old wearing a onsie my friend made. The front says "Birthday Boy Bandit". Next, I bought him a cushy seat that fits on top of the regular toilet. That one sucked because the splash guard was too wide and looked like it hurt his legs. So, I bought another cushy one with a built in guard in the molded cushiness. This one worked pretty well, so I bought another for the upstairs bath. Yet still, pee would get between the two seats once in a while, plus I really got sick of moving it back and forth for when we adults had to go. Finally I found the flip-n-flush! It's an awesome seat that attaches between the normal toilet seat and lid. Flip it down for them, flip it up for you, and you can close the lid when you don't wanna look at it. You can also pop it right off if you're having company and don't want them to see or deal with it. Now he can go to Pre School this fall... or as he calls it, "Pretty School", ha! I LOVE the flip-n-flush!! I just give the built in guard a wipe after I wipe him and we're good to go! We've watched Potty Time with Bear in the Big Blue house, along with Elmo a zillion times. I just love Bear tho. I discoverd him back in 1991 and said when I had kids they were gonna watch him! Good thing Nova likes him, lol... I found about 20 videos on eBay. Here's a portion of Bear's Potty Time. Pretty cute song! Next up is Potty Time with Elmo. This song is pretty cute too! Elmo *really* gets on my nerves tho, can't take much of him! It sounds like you are both doing really well with it...I always tell young moms, Don't sweat it, especially with little boys...my son didn't talk until he was 2+, and he didn't get the potty thing down until he was a little more than 3, and he is an emergency room physician now. So it all turns out eventually!!! Ooh, is Bear still on tv these days? I used to love that when my girls were little ones! He was always my favorite show to watch! Congrats to Nova for poopin' like a big boy! Don't be surprised if you have a bunch of set-backs though. I've always heard that boys are harder to potty train than girls. 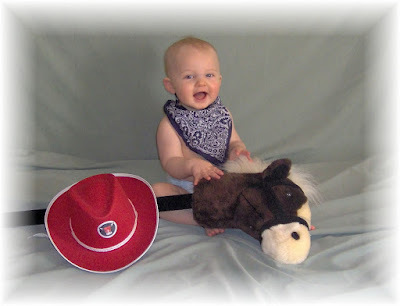 He's such a handsome little cowboy! I know you are so proud that he's getting the training down pat. Bless your heart, you've really been through it with the seats. It's so bittersweet when they grow up. On one hand you're so proud and on the other you want them to stay little. Those videos were hilarious! I loved the potty party video with the bear, and the Soulja Bear was too funny! Did you ever see "Looks Who's Talking 2" where they had the Mr. Potty Man? He was pretty menacing! 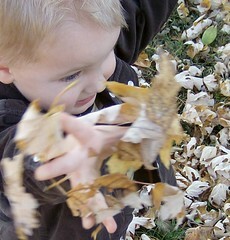 It seems if you wait long enough, kids just kind of let you know when they are ready and pretty much train themselves. Good for Nova! I'm going to send this to my daughter. Caden is turning 2 Sunday, she can use this info! Congrats! It's a big deal! I have been dealing with potty training too! We started Kyle about a year ago and it started off slow......but within the last few months he has been doing great. Other than he wouldn't go poo in the potty because it terrified him! We bought a candy machine and filled it with M&Ms and every time he goes poo he gets five pennies to get M&Ms. Then when the bank is full he gets to buy a small toy. He loves M&Ms so much the fear of going poo was short lived!! He still wears a diaper to bed for now but soon he will be out of that too! It is so exciting but also sad at the same time! Where did the time go?? I will have to check into those seats for Bella and Cali's training sessions! They look awesome! !